This article first appeared in the May 2010 issue of the Local Rag newspaper, describing a tea tasting and class I held at our bookstore before we added the tea bar. When I was a kid, tea was something that came in bags with a little tag that said “Lipton.” Visits to a Chinese or Japanese restaurant introduced me to the “other” kind of tea: green tea. The first time I ordered tea in a nice restaurant, I encountered the fancy presentation box, containing exotic varieties of tea like chamomile, Earl Grey, English breakfast tea, and Constant Comment. In high school, I drove a delivery truck for an office supply store in Boulder, Colorado, and one of my stops was Celestial Seasonings. By that time, I was probably a typical American tea consumer. I classified teas into herbal, green, medicinal, and “ordinary.” Not until quite some time later did I discover just how much I was missing, and in an April tea tasting at Red Lodge Books, I tried to pass on a bit of what I’ve learned. This article is a distillation of the talk I gave that day. All “true” tea comes from the same plant: Camellia sinensis. There are three major variants. The China bush (var. sinensis), the Assam bush (var. assamica) from India, and the Java bush (var. cambodi). Within those broad categories are over 1,000 individual subvarieties. Just as red climbing roses and yellow tree roses are both roses, all of these subvarieties are still Camellia sinensis, the tea plant. There are six generally-accepted ways to process Camellia sinensis leaves, which produce white, yellow, green, oolong, black, and pu-erh. Yellow tea is so rare that I decided not to cover it. All “true” teas have caffeine, including the delicate whites and greens. Red tea (a.k.a. African rooibos), which I’ll discuss next month, is made from a different plant that does not have caffeine. White tea is the least-processed, and generally lightest and sweetest-flavored tea. It is typically more expensive than black or green teas, and is recognized as having significant health benefits. It is brewed at a lower temperature, and steeped for a short time. The leaves can be re-used, to make 2-3 cups of tea from one teabag or container. The white tea we tasted at the bookstore was Rishi’s organic Silver Needle (Bai Hao Yin Zhen), from the Fujian province of China. This tea was voted the best tea in the world at the 2008 World Tea Championships, and the best white tea in 2009. The taste is very light and subtle, and there is a wonderful jasmine-infused version available as well. White teas start out as young budsets (an early bud with or two leaves). After picking, they are “wilted” indoors to get some of the moisture out, and then baked or panned. After a light rolling of the leaves, they are dried and packaged for shipment. Green tea is the traditional tea of China and Japan. It has long been lauded for its healthiness, and intricate ceremonies have been developed around its preparation. 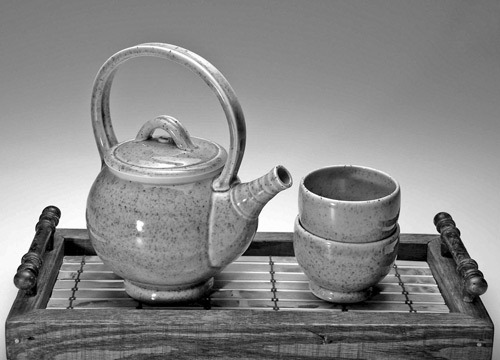 People study the Japanese Tea Ceremony for years before performing it publicly. Like white tea, it is brewed at lower temperatures, and can yield 2-3 infusions. The green tea we tasted was an organic Sencha from the Kagoshima Prefecture of Japan; voted the best green tea in the 2008 championships. It is a very traditional green tea, grown in volcanic soil, yielding a deep almost grassy flavor. After picking, the leaves are steamed or panned, rolled, and then dried. Sometimes, they’ll be formed into balls or other shapes before drying. Oolong is a very highly-processed tea; one of the most complex to produce. It is generally flavorful and rich without the bitterness often associated with black teas. Unlike green and white teas, the leaves are partially oxidized, which darkens the color and intensifies the flavor. We tasted an organic Wuyi Oolong. The Wuyi Mountains in Northern Fujian are where oolong tea was first produced, and this variety has a roasted aroma, complex flavor, and sweet finish. To make oolong tea, the freshly-picked leaves are first wilted (partially dried) in the sun, and then again indoors. They are tossed in a basket to bruise them, and then partially oxidized (typically anywhere from 30-70%). After oxidation, the leaves are baked or panned, and then rolled. The final steps are drying and firing, which produces the smoky aroma. By far the most common type of tea in Europe and India, black tea is usually brewed hot and strong. Many cultures serve it with milk, sugar, or both to mitigate its inherent bitterness, and it is often flavored with lemon, orange, or other spices (Red Lodge Books has a fascinating vanilla black tea). Black tea flavored with bergamot is known as “Earl Grey.” Black teas are also the basis of English and Irish breakfast tea. Unlike white, green, and oolong teas, black teas are generally only infused once: use the leaves and discard them. At the tasting, we had Rishi’s organic fair-trade China Breakfast, which won “best breakfast blend” at the 2009 World Tea Championships. It’s rich, malty, and robust; great for the first cup of the morning. Black teas are usually made with an indoor wilting, followed by a cutting or crushing step. This can range from a light crush to a full “CTC” (crush-tear-curl). This exposes more of the leaf’s insides to assist in oxidation. Black teas are 100% oxidized, yielding higher caffeine content and stronger flavor. Following oxidation, leaves are rolled and dried. This is probably the least familiar process to Americans, but it has been around in China for centuries. What differentiates it from black or oolong tea is a fermentation step at the end of processing. Although the term “fermented” is often incorrectly used instead of “oxidizing” for black teas, pu-erh is the only variety that is actually fermented. A cake of 2009 Tong Qing Tang Pu-erh tea. If you’ve ever had a mulch pile, you’re familiar with the process: plant matter is piled up wet, and left alone. The inside of the pile grows hotter as it ferments. Unlike most teas, which are served as fresh as possible, pu-erh is often compressed into cakes (sometimes immense bricks) that can be stored for years. 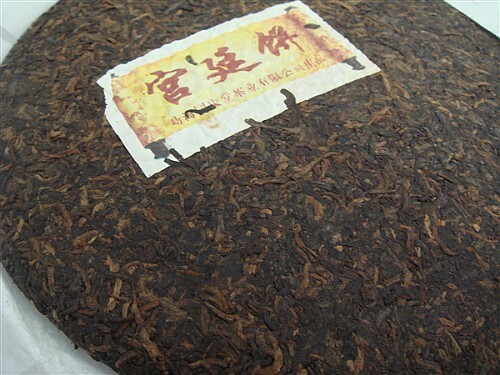 Century-old pu-erh cakes are sold at auctions for thousands of dollars. Pu-erh is brewed in boiling hot water, and can be re-infused at least 6-8 times. I’ve used leaves ten times and still gotten good flavor from the tenth infusion. At the tasting, we had a classic loose-leaf organic fair-trade pu-erh from Yunnan, China. The flavor was earthy and rich. The description may seem off-putting to some, but it’s definitely worth trying a good pu-erh. Posted on 5 November 2011, in Styles & Blends, Tea Biz and tagged black tea, China, CTC, fermentation, Fujian, green tea, Japan, Kagoshima Prefecture, oolong, oxidation, pu-erh, Rishi Tea, sencha, tasting, white tea, Wuyi, yellow tea, Yunnan. Bookmark the permalink. Leave a comment.